Princeton had its first snowfall of the season this week bringing winter fun and games to campus. But some traditions die hard: The freshman-sophomore snowball fight of 1892-93 left Darwin R. James, John P. Poe, and Arthur L. Wheeler of the Class of 1895 looking like disconsolate pugilists. 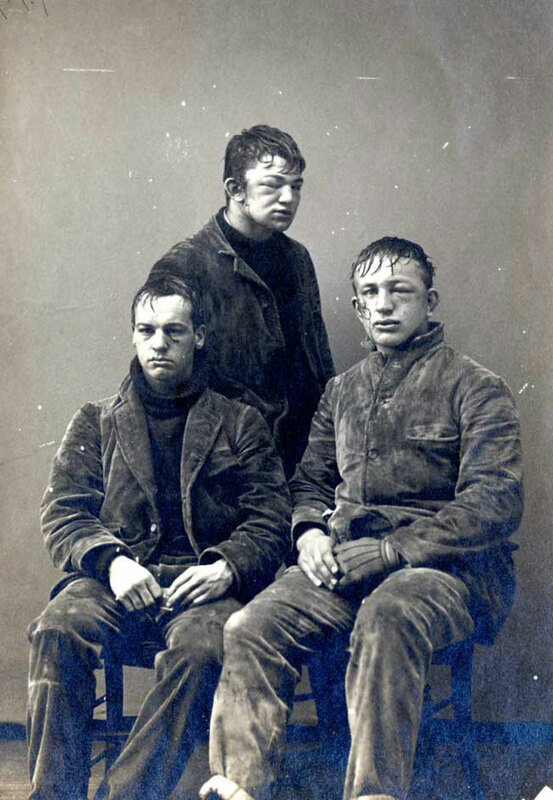 Did they sit for this portrait to bear witness to their bravery in battle or to protest the practice of filling snowballs with rocks? No one knows now. Today's kids are wimps - I say bring back snowball (w/ rocks) fights, and add inter-eating club boxing to the mix too! Maybe not so wimpy... While we no longer had an organized sophomore vs. freshman snowball fight, during my sophomore year, J.E. Paino managed to give my roommate Claire Brown a black eye during an impromptu snowball fight, and then gave me one in a separate instance of roughhousing just a few days later! And I'd be all for inter-club boxing too!! what's up sue...how you and claire doing?